What is unique about Picture Panache Framing & Design? Where are you located, and what are your store hours? 'By appointment' sounds expensive. Does this cost more? If I book an appointment, am I obligated to purchase? Do you bring samples with you to our home? How does custom framing work? Is the framing done on the premises? Can you help us select or source artwork? Is this item worth framing? What really sets us apart is our commitment to great design. We're the only Interior Design Team in Greater Victoria, BC that specializes in decorating with art, through custom framing design, art arrangement and installation. 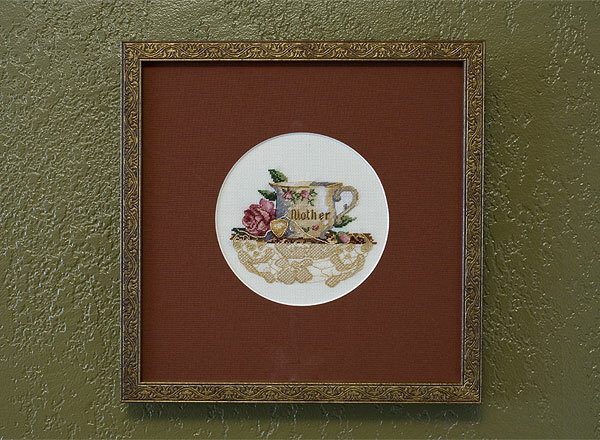 Not only do we create unique and beautiful custom frames which enhance artwork, but we also design the picture frame based on your personal tastes and décor. Your frame will be a piece of art in itself. A countless number of important details go into creating the perfect framing design for you, your art and your room. We are specialists in pulling together colours, textures, proportions and surprise elements in just the right combination, so the final design will enhance the art and contribute to your beautiful space. Plus, we hang the pictures for you! It's so easy because we're there every step of the way. Our expertise creates extraordinary results! Click here to book your private appointment. (Daytime, evening and weekend consultations are available for your convenience). VISIT US or WE'LL VISIT YOU: We have a beautiful showroom located in Sidney, BC where you're welcome to view many samples of our high quality finished work and products, including fine art frames, shadow boxes, mirrors and more. Or, we're happy to visit your home or office. Often, it's easier to describe exactly what you want when you can point to your wall colours and show us your room décor. That way, we'll make sure you get precisely what you're dreaming of. SAVE TIME, EVERY TIME: Never again haul your artwork into the framing shop and wait and wait and wait until a design consultant is available. With private appointments, we work one-on-one with you to understand all your design and framing needs. Take your time and enjoy the comfortable, easy Picture Panache framing experience. CONVENIENT & FLEXIBLE HOURS: We understand your life is often busy and hectic. We work by private appointment only because we value your time. Days, evenings, on the weekends, before or after work... you choose what works best for your schedule! Yes, I have a framing project in mind! Click here to book your private appointment. (Daytime, evening and weekend consultations are available for your convenience). Surprisingly, no. We're able to offer you exceptional service and one-on-one expertise without charging you more than our competitors. How do we do it? The difference is we're not paying employees to stand and wait just in case you come in. We'd far rather spend the same dollars on something that adds value to your finished product. With our private consultations, you always work with a qualified design professional and member of the Professional Picture Framing Association. Yes, I'm ready to get started! Click here to book your private appointment. (Daytime, evening and weekend consultations are available for your convenience). No, there is absolutely no pressure to buy anything. At Picture Panache Framing & Design, we care about building a positive reputation. So, it's extremely important that you have an enjoyable experience. Our priority is you, whether you're at the brainstorming phase or ready to get started. Once you meet us, we'll put your worries to rest. Whether you choose to spend money with us or not, it's an honour to be a part of your design process. Please feel free to book an appointment 'just to meet'. We are sincere about that. The appointment is always complimentary and there is never any obligation to purchase. We're just happy to have the opportunity to tell you about our business. If our services are not for you at that time perhaps you'll keep us in mind for the future or mention our name when you meet someone who you think could use our services. We treat people the way we would like to be treated. People find us friendly, honest, non-judgmental and never pushy. We'd love to get to know you better. Click HERE to book your FREE consultation today. Still not sure? If booking an appointment still feels intimidating, you could sign up for our email newsletter. In the newsletter, we list store events such as free mini-seminars, open houses and community trade shows where you'll have a chance to meet us in person, see some of our work, ask questions and form your own first impression. Yes, please sign me up for your newsletter! Click HERE to receive tips, helpful information and important dates. Not usually. We're very familiar and knowledgeable about a wide range of interior decorating options and framing materials. Until we understand your design needs, it doesn't make sense to bring a limited selection of samples to your home. At Picture Panache, we're known for getting it right the first time. Sadly, many other framing projects are done more than once. Or others are simply a disappointment because the framing design didn't take into consideration specific colours, furnishing styles, the amount of wall space or the overall tone desired. Worse yet, artwork can be destroyed with inadequate attention to conditions relating to light, humidity, heat or safety. That's why our custom framing process is so much easier. By visiting your home or office, we make recommendations based on your piece, your space and your tastes. We achieve professional results that will WOW you every time. Yes, I want a custom frame that's perfect for me! Click HERE to book your complimentary in-home consultation. How does custom framing actually work? 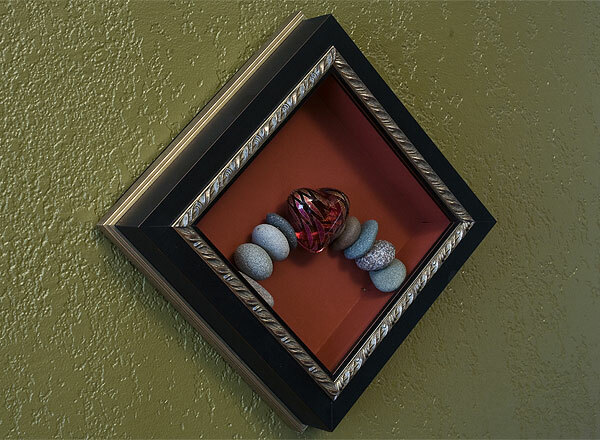 Custom framing is easy and simple. Below are the unique Picture Panache Framing & Design steps. STEP 1: Book your private, complimentary appointment by phone or e-mail. First, we'll chat briefly about your design dreams. What are you looking for? We'll also set a time and date convenient for you to meet with us. You can decide whether you want to meet at our studio or at your home or office. STEP 2: Your FREE consultation. At our initial meeting, we'll discuss your specific needs and ideas as well as view the piece you wish to frame. Together we'll plan some initial direction with respect to design and budget. Framing is very much about personal taste, so we ask lots of questions in order to get to know you better and design something perfect for you. Then Picture Panache will take responsibility for wrapping and safely transporting your artwork back to the framing studio. STEP 3: We create your dream design. Back at the studio, taking your preferences into consideration, the design consultant and professional framer will put together a design recommendation choosing from an endless supply of materials, colours, styles and unique options. Thoughtful consideration is involved as we sometimes spend several days reaching the perfect solution. Allowing time for creative juices to flow and percolate is what creates a dramatic final result that will WOW you! This process is not more expensive, but the final product definitely looks more expensive. Experience this luxury. You deserve it! STEP 4: The design is finalized & we always get your approval before going ahead. You may decide to meet for a second time to view our recommendations, and provide your input. Especially if it is your first time working with us and we are just learning about your personal preferences. We may work together to make adjustments to the design at this point. Clients who have been with us for a while often ask us to use our judgment and look forward to the surprise! Others love to play with colours and samples and are always welcome to participate in the process. STEP 5: Materials are all custom ordered and the framing is fabricated. Once the design is finalized, a prepayment will be due. Materials are then ordered from each of the suppliers. After all materials arrive, the project will be scheduled. Attention to detail during the fabrication means that you can expect exceptional workmanship. We are very proud of the quality we produce. Our clients know always expect high end results and that's what we provide. STEP 6: FREE delivery & installation. Upon completion, we blanket wrap your framed pieces, deliver and install them. 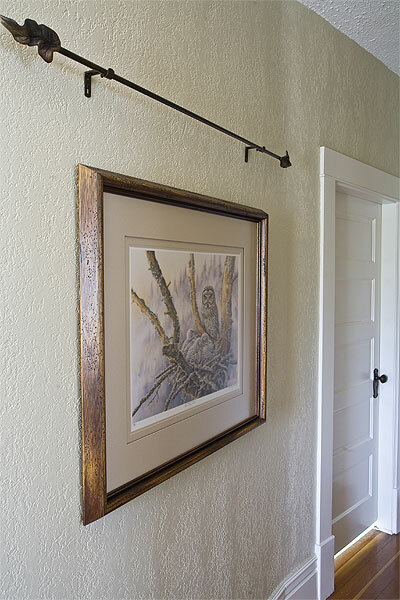 We know that many people find installing a wall arrangement or hanging even a single piece of artwork challenging. So we'd hate to see you with a wall full of nail holes. Worse yet, we'd hate to imagine your beautifully framed piece sitting propped on the floor because you're unsure of where or how to hang it. We're happy to go the extra mile to ensure extraordinary results. That's why this service is complimentary. It's our way of showing appreciation for your business. When you're happy, we're happy. Many framing shops do actually send their work 'out' to be fabricated. It's worrying when you don't trust the people involved or the quality of workmanship. That's why, at Picture Panache, all of our framing is handled 'in house'. This allows extensive cooperation between the designer and framer, so complicated or unusual designs can be clearly communicated. Yes, I want a truly custom frame! Click HERE to book your FREE consultation today. Generally, we ask that you allow two to three weeks. That way, we can order supplies from unique sources and take the time required to produce quality frames. If you have a specific date you need the work completed by, be sure to mention it. We will do our best to accommodate your request. What if I don't like my framing when it's done? 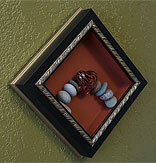 Our top priority is that you love your framing. If you don't, it's really important you let us know. We'll be more than happy to make whatever adjustments are necessary. Picture Panache custom framing comes with the guarantee that "You'll love it!" Your investment is protected because we take the risks, so you don't have to worry. Yes, absolutely. We have studied and continue to learn about conservation (also referred to as preservation, archival and museum quality). We understand the materials and processes most appropriate for framing your piece, taking into consideration the monetary, sentimental and decorative value. It's a serious responsibility and every year, we invest in professional development to ensure we are up-to-date on 'best' practices in framing methods and materials. If, there is a rare method we are unfamiliar with, we also refer to conservators who have extensive training and practical experience in chemistry and restoration treatments. I have something which requires conservation framing. CLICK HERE to book your private appointment and get all your questions answered. VIST OUR SHOWROOM or SHOP ONLINE: Yes! Primarily, we focus on framing. 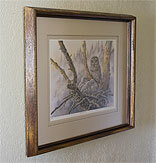 However, we do have beautiful fine art framing samples on display in our showroom. Frequently, these pieces are for sale. CLICK HERE to visit our SHOP ONLINE section and view our fresh designs. LOCAL ARTWORK FOR SALE: Although we're not a gallery, we love to support local artists. On occasion, we host events featuring the work of local artists which is available for sale. Unlike most venues, we do not take any commission. 100% of the proceeds, from the sale of the artwork, are given to the artists. CLICK HERE to join our mailing list and receive your invitation to our next event. YOUR OWN ART SHOW: We also make our showroom available to artists who wish to host their own shows. If, you're an artist or photographer who has always dreamed of having your 'One Person Show,' why wait? CLICK HERE to book your own art show. Can you help us select or source suitable artwork? YES, WE CAN HELP: Choosing art can be fun and easy; the process doesn't have to be intimidating. It's all about finding the images that speak to you. And, of course, we'd be thrilled to help in any way we can. CREATE ART THROUGH CUSTOM FRAMING: You may be surprised to find that you already have items stashed in drawers or in the back of closets. 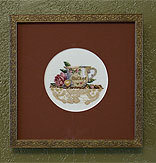 Dusting them off and designing a unique picture frame will bring these pieces to life and give your walls a jump start. After all, wall décor is as varied as your interests. You may choose to frame photographs, personal collections, memorabilia, printed materials, clothing, textiles, travel mementos, objects found in nature, the ordinary but visually interesting. IF YOU WANT IT, WE'LL FIND IT: We can also show you reproduction art from many fine art publishers, including limited edition, giclées and serigraphs. If you are seeking an original, we can direct you to a reputable fine art gallery. Here on Vancouver Island, we're blessed with talented local artists who will often welcome you right into their studios. Again, watch our newsletter for announcements of these events. ART FOR THE OFFICE: For our corporate clients, we are very experienced at recommending artwork that will compliment your business branding. Savvy business owners recognize the impact artwork can have in reinforcing and achieving corporate goals. Reflect the image, attitude and success you'd like to display to clients and staff. CLICK HERE and say goodbye to your wall décor dilemmas! We believe custom framing is a valuable investment and worth every penny spent. Custom picture framing only seems expensive until you understand what goes into a professionally designed and custom fabricated frame package. TOP-OF-THE-LINE MATERIALS: With each frame package, we use a variety of high end materials which are ordered and shipped specifically for your project. They come from a variety of suppliers and they all require very careful handling in order to prevent marring, scuffing, scratching or breakage. These quality materials look significantly better and last longer. QUALITY WORKMANSHIP: All elements (such as glazing, spacers, mat board, mounting board, hinging, backing board, moulding, dustcover and hardware) must be individually hand-cut to fit perfectly. Our professional framer is trained to build frames that are truly works of art. UNIQUE TO YOU: Ready-made frames are designed for the general public and assembled by the millions through automation or assembly line. Our frames are specific to your needs and personal taste. You can choose from a wide variety of materials of preservation quality such as UV protective glass, archival mat boards and hinging methods. High end designs that you will be proud to hang. LASTS A LIFETIME: Quality custom picture framing is an investment that generally outlasts every major appliance you'll ever purchase, not to mention your carpet and soft furnishings. In other words, framing is one of the least expensive ways to positively impact a space on a cost per day basis. 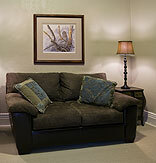 YOUR WALLS ARE A FOCAL POINT: There is more square footage of wall space than any other surface in your home. 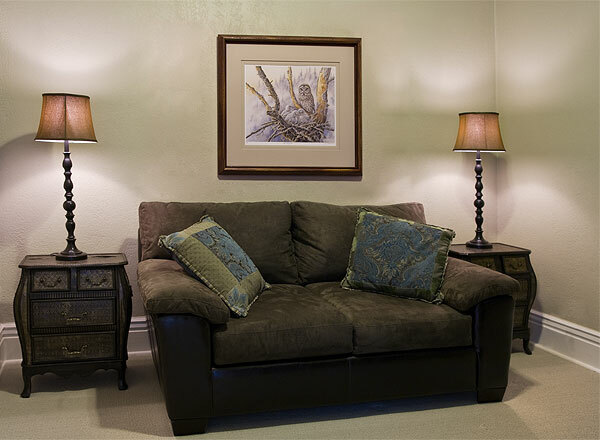 The right image, in the right frame, with the right placement has a huge impact on how your rooms look. And how you, your family and guests feel while spending time there. The framed pieces on your walls impact you personally every day. Yes, I want a framing package designed just for me! CLICK HERE to book your complimentary appointment. If you're asking yourself this question, then the answer is most likely yes. The price of the art doesn't matter. It's whether it's meaningful to you. Whether it's an 8" X 10" calendar print or an 8" X 10" Rembrandt, they both require the same amount of time, materials and labour. If you stick either the calendar print or Rembrandt in a cheap, ready-made frame... they will both look as if they have no value. For those of us who can't afford a Rembrandt, we can still frame inexpensive items and make them look just as spectacular as any original artwork. It's all in how it makes you feel. With vision and creativity, we'll help turn an inexpensive item into something that's totally 'YOU!' Your custom framing will bring you personal satisfaction for years to come. Treat yourself to custom framing today! CLICK HERE to book your private appointment.